"From structural changes in chemistry to molecular signaling, all dynamical processes in life have to do with molecular vibrations, without which all would be frozen," said co-author V. Ara Apkarian, CaSTL director and UCI Distinguished Professor of chemistry. "We've long been aware of these vibrations. For ages, we have been measuring their frequencies through spectroscopy—but only now have we been able to see what is moving and how." 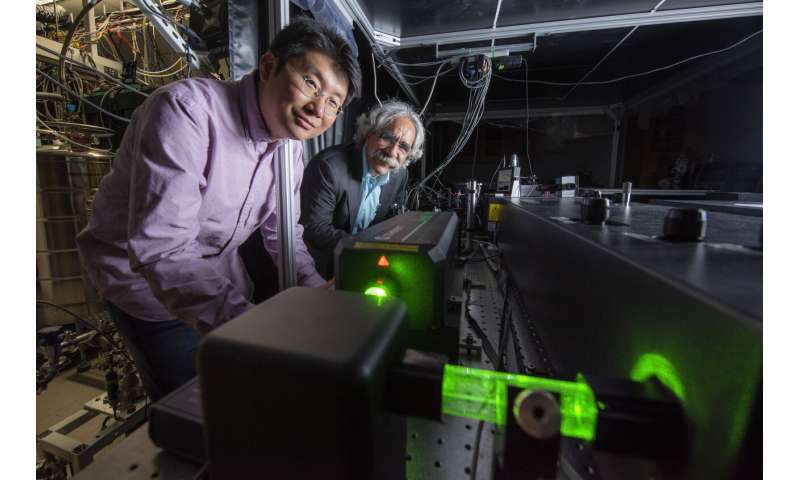 Co-author Joonhee Lee, CaSTL research scientist, added: "To date, molecular vibrations have been pictorially explained using wiggling balls and connecting springs to represent atoms and bonds, respectively. Now we can directly visualize how individual atoms vibrate within a molecule. The images we provide will appear in textbooks to help students better understand the concept of vibrational normal modes, which till now had been a theoretical concept." To achieve atomic resolution, CaSTL researchers set up their experiment in an extremely high-vacuum and low-temperature (6 kelvins) environment to eliminate all external motions and positioned their single-atom probe near the targeted molecule, within a distance less than the size of an atom. Glass lenses wouldn't work in this type of microscopy, in which features are resolved on a scale that's a thousand times smaller than the wavelength of light. "The limit of what you can see in standard microscopy is half the wavelength of light, which is on the order of half a micron, from which the microscope derives its name," Apkarian said. "The optical microscope revolutionized cellular biology because through it you can observe what's happening inside a cell—but a molecule is one-thousandth the size of a cell." "We have a microscope now that can resolve atoms, and we're using it to look inside molecules, which was unthinkable only a few years ago," Apkarian said. "The spatial resolution of optical microscopy has been advanced by another notch, and what we're seeing at this scale is truly amazing." "This National Science Foundation-supported team reached a major milestone by overcoming impossible barriers to develop a new instrument to 'see' the individual atoms of a molecule in real time and space," said Kelsey Cook, NSF chemistry program director. "This invention will lead to unprecedented, transformational understanding of how molecules react and cells function."